• In order to hold space on a definite basis, a signed contract and deposit is required. Space for the event is booked only for times indicated. Should setup and dismantle times be required, please specify at time of booking as additional charges may apply. • A more suitable function room may be assigned to your group should the number of guests and/or set up requirements change. Room rental will be charged accordingly. All changes will be discussed with the client prior. *Please note that if the room setup needs to be changed on site without prior notice a labor fee may be charged*. • Supplies and equipment must be removed from the property at the end of the function. Additional space may be rented for overnight storage and would be subject to applicable room rental fees. • All functions require a 50% down payment of the event within 72 hours of booking. • Any cancellations within 14 days prior to the event will be subject to a $500 non-refundable charge. Please note the $500 non-refundable deposit will be applied to your function costs. • Please note that the deposit is non-refundable and will be applied to your function costs. • Groups with business of $1000.00 + per month may apply for direct billing prior to the event. If payment is going to be made by credit card the card will be charged 1 week prior for 95% of the known charges. The remainder will be charged to the card after the event. For all social functions, the deposit is required within 2 weeks of booking. The remainder is due 2 weeks prior. If paying by cheque, the cheque is required 2 weeks prior. • Limited audio visual equipment is available. Details can be arranged through the director of sales or you may choose an alternate supplier. • Confetti or confetti like substances are not allowed in any meeting or public space in the hotel. Should they be used, cleanup charges will apply. • Security: the inn does not assume liability or responsibility for damage or loss of personal property and/or equipment left in the function room. Additional security services can be arranged on your behalf with advanced notice. • Shipping, Receiving and Storage: minimal amounts of materials/supplies for your function may be delivered and stored at the hotel one business day prior to the function. All items must be clearly marked with the name and date of the function on each box. We reserve the right to charge a $25.00 Fee for storage/handling of the items delivered to the hotel (the client will be notified in advance of this fee). • Display Materials: to avoid damage to the wall coverings, we do not allow the use of strong tape (i.e. duct tape), tacks or any other attachments for posters, flyers or written materials to the walls or doors without prior consent from the hotel. • Function room: If attendance changes, the hotel reserves the right to substitute the function room for a more suitable room. • Guarantee: The charge for the meal function is for the guaranteed or actual number attending, whichever is greater. The guarantee minimum number can be revised no later than 72 hours prior. Should no guarantee be revised, the number of expected is charged. The hotel will prepare up to 10% over the guarantee to a maximum of 10 additional guests. • Liabilities: The paradise inn/major’s homestyle is not responsible for personal injuries or any loss or damage to any goods, property and/or equipment brought into the hotel by the convener. • Service & Tax: An 18% gratuity is applied to all food & beverage, 5% GST is applied on all services. • Room Arrangement: Rooms will be set to the specifications outlined in your signed contract. • Socan Fee: The society of composers, authors and musicians fees are applicable to all events that have music. The hotel will apply the Socan fee to your final bill on behalf of the society. • Re: Sound Fee: Is the Canadian not-for-profit music licensing company dedicated to obtaining fair compensation for artists and record companies for their performance rights. On behalf of its members, representing thousands of artists and record companies, Re: Sound licenses recorded music for public performance, broadcast, and new media. Re: Sound is also a member of the Canadian private copying collective, created to receive private copying levies from the manufacturers and importers of blank audio recording media. The hotel will apply the Re: Sound fee to your final bill on behalf of the society. • Miscellaneous: Open flames are not allowed anywhere on hotel premises. • Menus: the catering department welcomes the opportunity to create personalized menus for any occasion. We look forward to ensuring you have the best holiday party possible! • Our wide variety of appetizers, entrees, and desserts has been designed to offer you flexibility in creating your menu. Don’t see what you are looking for? Our executive chef welcomes the opportunity to create a customized menu upon request. • When selecting your menu, please remember that for each function the menu must be identical for all guests attending. Special dietary substitutions are available and must be arranged well in advance of the function. Guests requiring the special meals must be identified to the banquets manager prior to the service commencing. 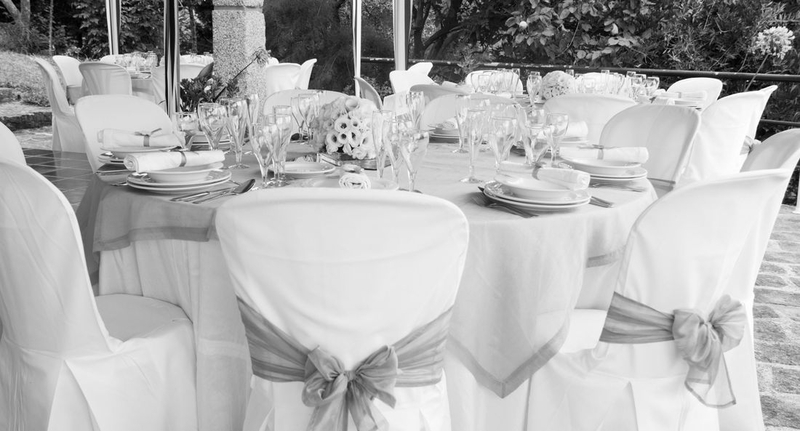 • A guaranteed number of guests attending your function is required 3 business days prior (not including the day of) to the event to ensure correct setup and food quantities. If the number is not received by this time the estimated number of guests indicated at the time of the booking will be taken as the guarantee for billing purposes. Should more than your guarantee numbers of attendees arrive to the function the chef always prepares 10% extra, however you will be charged for the extra guests. • Prices quoted are guaranteed for 60 days. • Our catering department will be happy to assist you in developing special requests including, but not limited to, reserved seating arrangements, floor plans, and registration tables. • Start and finish times of all functions are to be strictly adhered to. Space is only booked for the time indicated. Any set-up and tear down times are to be specified at the time of booking. • All food & beverage served is to be provided by the Paradise Inn/Major’s Homestyle, the only exception being a wedding and special occasion cakes. In accordance with health & safety regulations, the Paradise Inn/Major’s Homestyle prohibits guests from removing any food and beverage products after the function, with the exception of a wedding and special occasion cakes. • The Paradise Inn/Major’s Homestyle is responsible for all beverage sales and service in accordance with the Alberta gaming and liquor commission. The Paradise Inn/Major’s Homestyle will supply alcoholic beverages served in a licensed public area. No alcoholic beverage of any kind is allowed to be brought into the Paradise Inn/Major’s Homestyle meeting room areas for sale or consumption other than through the Paradise Inn/Major’s Homestyle. • Juice and soft drinks are always available as non-alcoholic beverages for all licensed events. • All menu prices are subject to change without notice to reflect current market conditions. Prices do not include 18% service charge or 5% GST. Our grand Richmond Ballroom offers 4,432 sq. ft. of pillar-free space for all your guests. The attached reception area features an additional 2,500 sq. ft. to create a private second-floor retreat ideal for corporate functions, award galas, retirement parties and any event that demands an attractive and versatile venue. The ballroom’s modern appointments combine with classic touches like 16’ vaulted ceilings, chandeliers and floor-to-ceiling windows for a setting that complements any special occasion. For smaller functions, the Richmond Ballroom may be divided into up to 4 separate rooms. Featuring 3,200 sq. ft. of meeting and conference space, the Rotary Room is a self-contained function room with a wall-mounted screen, permanent stage and outside access. offers a cozy 250 sq. ft. of meeting space and also a great space for board room meetings. THE PERFECT SITE FOR YOUR EVENT…..
With over 8000 square feet of conference facilities, our meeting rooms are designed to comfortably accommodate 2 to 250 people. Our 4432 Square foot, pillar-free Richmond Ballroom with vaulted ceilings adjoins a private 2400 square foot reception area that ensures a smooth-flowing event. The Rotary Room afford outside access and is a completely self-contained room ideal for groups of up to 160. With a wide variety of appetizers, entrees, and desserts, our extensive catering menu offers you the flexibility to choose the gourmet cuisine that’s right for your event. Don’t see what you’re looking for? Our Executive Chef welcomes the opportunity to create a customized menu to make your event a culinary success. We are also pleased to offer bar service on a cash or host basis.